Brake and break sound alike, but their meanings are different. Brake is often used as a noun meaning a device that stops movement.It may also be used as a verb meaning to stop movement. Break is a word with many meanings. It is often used as a verb it means to destroy, smash into pieces, or put to an end. It may also be used as a noun to mean a short opening or a pause. 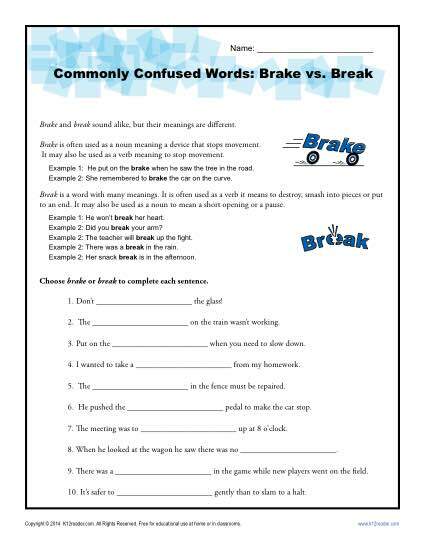 Choose brake or break to complete each sentence in these printable worksheets. You may find it helpful for Common Core Standards for Language for 4th grade, although it may also be useful for other students.